Ramingining has joined the growing community movement in saying ‘No More’ to domestic violence. Driven by East Arnhem Regional Council Youth Worker Mentor Will Gee in partnership with the NT Police, Ramingining locals were joined by No More Founder and domestic violence advocate Charlie King, members of the local football teams, RJCP, ALPA, AFLNT, the local health clinic and the school, linking arms in support of the campaign and saying ‘No More’ to family and domestic violence. 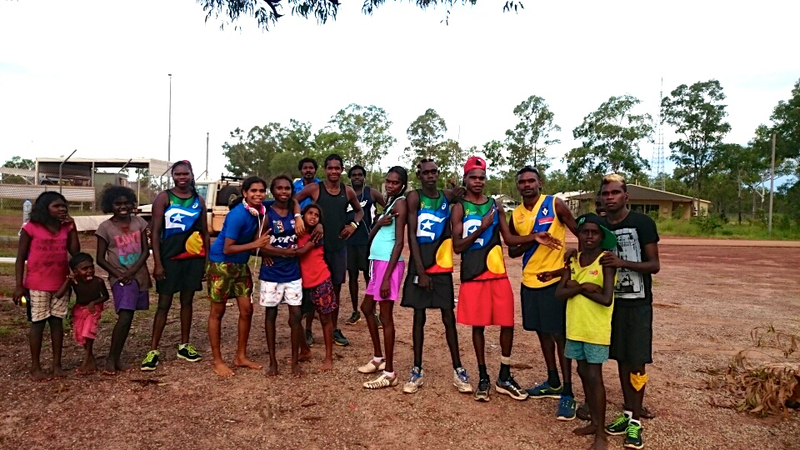 In collaboration with the four teams in the EARC Football League, a domestic violence action plan was developed and a committee made up of traditional owners and the players formed, with the committee overseeing the implementation and engagement of the plan moving forward. Importantly, male students from year five onwards attended and participated in the day. For Council and community members, it was a great opportunity to have Charlie King and his team in Ramingining to reinforce the community safety work that is taking place and bringing residents, stakeholders and importantly our youth together to discuss this very real problem. Across the nation the issue of family and domestic violence is not going away. The aim of the No More campaign is to reduce family and domestic violence by engaging men in the sporting community at both the grassroots and national level. Ramingining is proud to be a part of this campaign. East Arnhem Regional Council communities will continue to see strong benefits throughthe Federal Government’s Indigenous Advancement Strategy funding,with Council recently signing off on a 3 year, $12.8mil grant. Funding under this grant will support the ongoing delivery of our essential programs in Youth, Sport and Recreation, remote indigenous broadcasting, and the Night Patrol service. As part of the wider agreement, Council was also successful in securing funding for the installation of community announcement systems in three East Arnhem communities. After being trialled in Yirrkala with great success, the project now has the financial backing to be rolled out in Milingimbi, Ramingining and Galiwin’ku. Improving communication between Council, community members and other local service providers, the pilot project saw it used to broadcast bushfire threats, mosquito borne disease and spraying information, daily RJCP messages, promotion of school attendance, and community events just to name a few. Involving the installation of multiple speaker stations around each community, the system provides the capability to broadcast safety messages similar to those broadcast to mainstream communities through text messages by government service providers. The system will allow Council (with all appropriate approvals) to broadcast on the frequency of local radio stations, extending the reach of broadcast to residents. The master units will be located in Council’s Community Offices and will include in-built memory units which allow for automatic broadcast of pre-recorded messages. These can be set up for any time, any day, depending on type of emergency or natural disaster. Council welcomes the funding through the IAS, acknowledging the signing of the agreement is a significant outcome for our communities, ensuring continuation of our existing services and jobs. It is with deep remorse that East Arnhem Regional Councillors and staff pay tribute to former Northern Land Council Chairman, Mr Wunungmurra and extend our sympathies to his brother, East Arnhem Regional Council President Mr Banambi Wunungmurra and his family. A signatory to the 1963 Yirrkala Bark Petitions, Mr Wunungmurra was a senior Aboriginal leader, respected throughout Australia. Decades of tireless work championing Aboriginal rights was recognised recently, honored at Garma Festival as a Yolngu Hero. While his gentle nature, love of education and advocacy for indigenous rights leaves a legacy that will be profoundly missed, he has paved the way for the next generation to follow. Rest in peace brother, friend and family member. From the Councillors and Staff of East Arnhem Regional Council. East Arnhem Regional Council has released the Draft 2015/16 Council Plan & Budget. Robust and responsible, the 2015/16 Plan & Budget aims to continue the essential work across our core service delivery areas. Council recognises the impact of Cyclone Lam and Cyclone Nathan on the day to day functioning of several East Arnhem communities, with consideration given throughout our Plan & Budget in assisting with the continued rebuild efforts. President Mr Banambi Wunungmurra is confident that the 2015/16 budget will continue to deliver on key projects, providing high quality services and sustainable employment and development for the people of East Arnhem Land. “I’m excited to announce a new Indigenous Technical Officer Traineeship has been identified which will work directly with our Regional Managers in Roads Infrastructure, Building Infrastructure, Fleet Management and Environmental and Waste Management” said the President. “We’ve also been busy working on a Regional Waste Strategy and will focus on further implementation of this as well as landfill upgrades across the region” continued Mr Wunungmurra. The Budget includes in excess of $5m for Aged and Disability Services, $1,821,881 for Youth, Sport and Recreation, over $900,000 for Children and Family Services, and $2,237,092 for Community Safety services and projects. The President encourages community feedback and discussion on the Plan. “This is a very solid and well considered budget. In the past four months parts of our region have suffered severely from the impacts of Cyclone Nathan and Lam, and the Budget takes into consideration rebuild and support priorities, as well as continuing the high level of service delivery that Council is accustomed to providing”. East Arnhem Regional Council makes the following statement in relation to the current veterinary practice situation within the township of Nhulunbuy and Council’s veterinary services delivery capacity. Council recently engaged with the NT Government to appoint professionals to prepare a Feasibility Study reviewing the viability of a stand alone Veterinary Service for Nhulunbuy, of which Council could consider operating. After considering the results of this study, Council has voted not to pursue this service. EARC allocated considerable time and resources in the investigation of viability, working with key stakeholders in the search for a solution, and we are disappointed at any reference suggesting otherwise. Council strives for continual improvement and delivery of our Animal Welfare Program, which provides a very limited veterinary service. The program works to develop appropriate policies, consult with community members, explore options for animal population control, educate community members and develop skills and capacity within communities to support the program. The program extends to “discrete Indigenous communities” and as such does not extend to Nhulunbuy which is not a designated operational community (as previously listed above). East Arnhem Regional Council has now moved into the clean up and recovery stage post Cyclone Lam, with efforts underway in East Arnhem communities Milingimbi,Ramingining, Galwin’ku and Gapuwiyak. To date communications, water and sewerage have now been reestablished in all four communities. Power is currently back on line to power stations and service lines,however updates over the next 24hours are expected relating to customer reconnection. Water ‘Boil Alert’s’ have now been lifted in all communities. Roads have now been cleared to all airports, airstrips and barge landings. Council President Banambi Wunungmurra highlights the pre-cyclone preparations undertaken in reducing the impact and severity of damage by Cyclone Lam. “Council worked closely with the NT Police, Fire & Emergency Services, PowerWater, RJCP providers, and relevant community stakeholders in each of the affected communities to ensure Cyclone Management Plans were enacted. This has resulted in reduced impact caused by the Category 4 cyclone. Together we are now working to reduce and remove potential hazards caused by the cyclone’s destruction, and get community life back to normality as soon as possible. I commend all parties for their hard work in both the planning, preparation and now clean up, and we intend to continue to work with the Disaster Recovery Teams during this phase” said President Wunungmurra. Extensive damage to both infrastructure and bush growth has seen the bulk of the work created, with Galiwin’ku on Elcho Island the worst effected community. With a population of over 2 000 residents, emphasis is heavily focused on providing running repairs to residencies and ensuring access to clean water and appropriate health facilities. Updates will be continue to be provided as damage assessment and clean up continues. It is with deep remorse that East Arnhem Regional Councillors and staff pay tribute to Gapuwiyak Local Authority Member, Mr Marrkula, and extend their sympathies to his family and people on his passing on 3 January 2015. His contribution will be remembered and missed and we thank him sincerely. Rest in peace brother, friend and valued community and family member. From the Council President Banambi Wunungmurra, Councillors and Staff of East Arnhem Regional Council. On 26 November 2014, East Arnhem Regional Council Councillors voted unanimously to appoint Councillor Gawura Wanambi as Deputy President, East Arnhem Regional Council. Elected as a Councillor in the 2012 NT Shire Council election in the Gumurr Miyarrka Ward, Deputy President Gawura Wanambi is serving his first term in Council and first term as the Deputy President. Deputy President Wanambi was born in the Arnhem Bay area, an area established long before Gapuwiyak was formed. Gawura is a member of the Marraŋu Clan and his homeland is Raymaŋirr. During the Ordinary Council Meeting on 11 April 2012 Council resolved to approve a 2 year rotation of the Deputy President role, which would be applied for the period of the the current Council Term (at the time 2012 - 2016). Gumurr Marthakal Ward Councillor Mavis Daŋanbarr was the first Councillor to be elected as Deputy President during this term. Council President Wunungmurra welcomes the appointment of Deputy President Wanambi, recognising Councillor Duŋanbarr for her achievements. “Councillor Duŋanbarr has represented Council and her people with the highest integrity and dedication during her time as Deputy President. Her contribution was often above the call of duty, an exceptional Deputy, leader, and individual. I thank her for her work whilst Deputy President, and look forward to working alongside her in Council as she continues to represent and advocate for the people of the Marthakal Ward” said President Wunungmurra. Newly elected Deputy President Wanambi has hit the ground running. “I am honoured and excited to be taking on this role. The recognition by my fellow Councillors is humbling, and I look forward to continuing the hard work of my predecessor. This is a proud moment not only for myself, but for my people” Deputy President Wanambi said. Mr Wanambi continued, “My commitment to advocating and improving services in Gapuwiyak will stay strong, at the same time working for all of our people in East Arnhem Land. I look forward to working alongside President Wunungmurra - together we can achieve great things”.